You can write a mile long list of reminders on your phone, but you'll still forget them all if it's tucked away in your pocket. 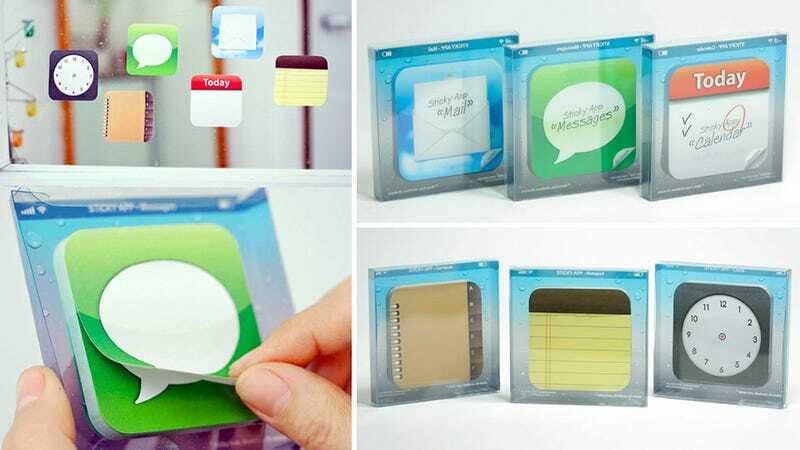 That's why sticky notes have yet to be replaced by deviced like the iPhone, and these app icon-themed pads seem like they're rubbing that fact in. There are six different pads to choose from, loosely based on the icons for iOS's mail, messages, clock, contacts, calendar, and notes apps. And while they're close enough to be recognizable, they're still different enough to dodge a lawsuit from Apple. Eighteen bucks gets you all six, just keep in mind you'll definitely need a stylus to use them.